Hi friends! We have so many new followers here on the Daisy Farm that Hannah and I want to take a bit of your time and introduce ourselves and also give longtime followers an update. I’m Tiffany and call myself a grandma-in-training. About three years ago I had a thought in my head that if I crocheted it, maybe they would come. “They” meaning grandbabies, and “grandbabies” meaning a baby for my oldest daughter Hannah who had been trying for a few years. I wrote down my patterns on a blogspot blog to keep track of what I was making and learning about crochet. I felt like maybe those future grandbabies would one day be curious about how I had prepared to greet them as they came into the world. And, maybe they would one day also want the patterns to the blankets I was making them. I’ve written previously in greater detail about how it all began, if you’d like to read further, but to sum up, I thought for sure that any one of those first few baby blankets I made would certainly be the “one” blanket that was for that future grandchild. Yet, here I am, almost four years later, still crocheting and still a grandma-in-training. But also I’m deep in gratitude for that little “crochet it and they will come” mantra that popped into my head so long ago. I realize that the “they” could be all of you! And that makes me tear up and fills my heart with a warmth that is hard to describe. The journey to grandma-hood I thought I was setting out on is nothing that I ever could have imagined. Thank you my dear crochet friends, thank you. 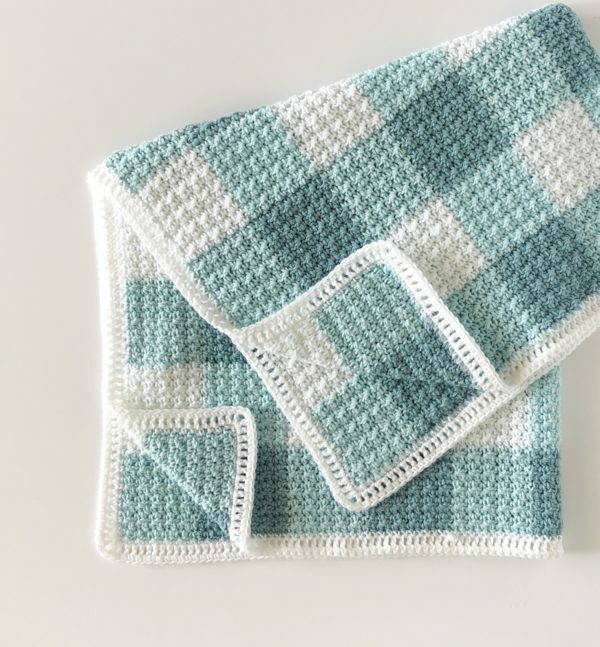 My absolute favorite blanket design I’ve made so far are my gingham blankets. I’m thrilled that so many of you have found your way to Daisy Farm Crafts because of your love of gingham. I still am amazed every time someone shares a finished gingham to my facebook wall or Instagram hashtag #daisyfarmcrafts. They are so beautiful! I will never tire of them and hope they will be a timeless baby blanket design. My daughter Hannah is the oldest of our five children. She wasn’t planning on running a crochet website as her life goal either! But thank heavens I have her. She and I now run the website and all aspects of Daisy Farm Crafts together. Hannah and I brainstorm about new projects, design, crochet, blog, write, video, post, and answer as many emails as we possibly can. On an average day, over 20k people visit our website. We receive anywhere from 50 to 100 messages, emails, or comments every day too. We try to answer as many as possible but sometimes have had to pray you’d understand that we can’t get back to all of you. We read all the email that comes in, and I try and incorporate answers to common questions into blog posts or social media posts. I truly appreciate the comments and love if you spot a mistake. That helps us get better! Sometime this week, I was thinking back to my earliest memories of crochet in my life. I remember my mom showing me how when I was about 11 or 12 and I’d practice here and there, I don’t remember a specific project. I do remember watching her at night relaxing and crocheting. She made all my children white blessing blankets. Then I remember trying to crochet a baby blanket when Hannah was born, but I could never get the sides straight so I never finished it. Hannah loved dragging the white blessing blanket my mom had made for her (which I still have and it’s the dingiest gray ever.) She slept with it every night and called it her “dis”, which as you can imagine it was a huge catastrophe if “dis” ever went missing. I didn’t crochet the years I was raising my kids. It wasn’t until Annie, my youngest was diagnosed with epilepsy that I thought of crochet again. I had long days sitting in the hospital with her and needed something to do. I remember thinking I should learn to crochet hats. I practiced every time Annie had a rehab appointment after her brain surgery. Then I challenged myself to learn more stitches, tackle that tricky chevron pattern, and learn more about yarn. I really only had experience with the yarn I could buy from Wal-mart which mostly I used Caron Simply Soft because of all the color choices. I found myself standing in the yarn aisles at Joann’s or Michaels reading labels and figuring out hooks sizes, yarn types, and brands. But then Hannah and I were talking just this week how crochet has popped up throughout our life like a quiet friend, encouraging us or helping us out. She remembered that on her wedding day, almost eight years ago, she and I were alone in the bride’s dressing room, getting her into her dress. She had a dress with buttons all the way down the back that could only be buttoned with a crochet hook, which we had forgotten to bring with us. I had a thought to look through a desk drawer that was in the room. I opened every drawer and finally in the last one, tucked into a back corner was a little silver crochet hook. And just like that we were rescued and there was crochet in a small way helping us. So maybe it wasn’t a fluke that I turned to crochet when I thought that might help Hannah have a baby. Maybe I always turn to my quiet friend named crochet when I need that extra encouragement. I don’t really know, but crochet is a skill I’m glad I’ve practiced. Hannah and I have both come to realize that although a baby would be a wonderful outcome to all of this crochet, it really might not be the outcome. We don’t know the future. I still crochet in faith but it’s a faith that I know we will all be fine with whether I become a grandma to one of her babies or not. Recently, we received an email from a new follower I’d like to share with you. I appreciate hearing stories and experiences like this from you all and especially when you tell me about the peace you also feel when you crochet. Crochet really feels like that quiet, encouraging friend and it’s a nice companion to have. Thank you all again so much for being on this journey with us and coming to visit our website. Thank you for making our patterns and sharing your love of crochet with others. Most of the time you are making blankets to welcome brand new babies into this world. So in the smallest of ways, and through you, I have crocheted and those babies have come.